The creators of "The 9/11 Report: A Graphic Adaptation" call the publication "graphic journalism" rather than a comic book. I usually defend the phrase "comic book," trying to give it the dignity it deserves. After all, this American-invented art form combines words and pictures in brilliant balance, carrying forward stories and concepts in a way approached only by feature films, and actually does movies one better by being able to juggle simultaneous, parallel stories. 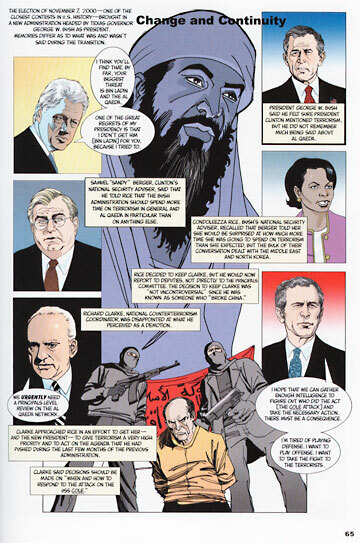 I was struck by this skill in the opening section of "The 9/11 Report: A Graphic Adaptation" (Hill and Wang, $30 hardcover, $16.95 paperback), a work that uses comic-book skills and techniques to illustrate the government's analysis of the Sept. 11, 2001, attack, and uses them in a way that could exist only in a comic book -- a four-part time line that tracks the four hijacked airliners, so readers can respond either left or right or up or down to cross-understand what was going on at any particular moment. It is a tour-de-force display of comic-book storytelling and illustration, used in a way that makes information far more clear to the average reader than a traditional narrative in a government report or history text. But it's something beyond being "just a comic book." The creators call it "graphic journalism," and that's a good start because the way information is edited and assembled here has more in common with a newspaper informational graphic than a traditional comic book. This is data cleverly and clearly presented, not a story with characters. "The 9/11 Report," published by the nonfiction wing of book conglomerate Farrar, Straus and Giroux Industry, has become something of a surprise best-seller. It was created by industry veterans Sid Jacobson and Ernie Colon -- they aren't kids, being both in their 70s -- who worked together for several decades at Harvey Comics, churning out such titles as -- get this! -- "Richie Rich" and "Caspar the Friendly Ghost." It's likely a tribute to their storytelling abilities that both Richie and Caspar later became movies, and the 9/11 Commission report was the basis for the TV agitprop film shown last week, "The Path to 9/11," so the comparison of their work to film or documentaries is particularly apt. Colon, in particular, is a fabulous draftsman with a sweeping, bold style that always looks like original hand drawings instead of tracings, and he's a master of subtle caricature. The personalities and characters of the individual hijackers were never so clearly expressed. Comic-book artists were among the "first responders" in the arts world to the 9/11 assault, and Jacobson and Colon wanted to do something. 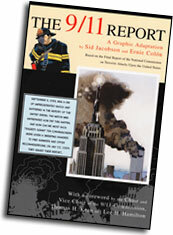 The 9/11 Commission report provided the raw data, as well as being in the public domain. The pair scrupulously stuck to the facts and conclusions contained within the report -- unlike "The Path to 9/11," which was caught awkwardly falsifying things in order to make our incumbent president look competent -- to the point where the conclusion feels somewhat pedantic. It trails off, and ends, as these things do, with the government's current failing grades in implementing the commission's commonsense recommendations. But hey, it's an illustrated, edited, graphic adaptation of a mass of confusing data. It isn't a comic book with a slam-bang ending. The slam-bang beginning was scary enough.